"Redemption is real and redemption is alive." I’m one of 1.4 million Floridians who can’t vote because of a past conviction. Support from society in allowing us to vote again is so important. It’s saying that we belong, we’re ok, we’re accepted. I’m sharing my story to move people to promise to vote on my behalf. My father was a 2-tour Vietnam vet wounded in action. He was very abusive, emotionally and physically. I learned at a very young age to lie and not talk about the things happening to me. As I got older, I started spending a lot of money, bouncing checks, and I ended up in jail. When I got out, I got a degree and worked really hard despite roadblocks. When I found out that I couldn’t vote, I felt like I had been silenced. So I try to tell everyone I know about my convictions and my beliefs. I’ve worked really hard to have a name that has integrity behind it. Redemption is real. I hope you promise to vote on my behalf, and on behalf of the millions of others who don’t have that opportunity. Thank you. 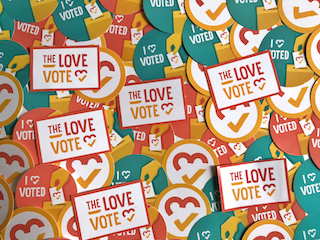 Show Coral love + inspire others + get voting info + get event invites + get stickers + create change!